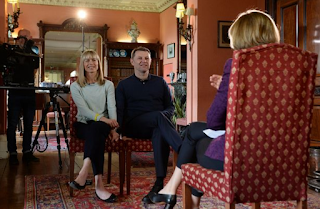 Fiona Bruce : Kate and Gerry, first of all, thank you very much for doing this interview. This is a very difficult time of year and it's the 10-year anniversary, obviously an anniversary you hoped you would never see. Kate MC : Yeah I mean I never thought we'd still be in this situation, so far along the line. It's a huge amount of time. In some ways it feels like it was only a few weeks ago, in other times it has felt really long. But it's a hard marker of time. FB : And you've referred to it on your website as "stolen time"? FB : And you can never have imagined, 10 years ago, that you would still be in this situation? Gerald MC : I think the situation is that we tried everything in our power to not have a long protracted missing person case like this. It's devastating and we really threw ourselves into trying to do everything we could to help find her. It looks like that hasn't worked yet. But you know we are still looking forward, I think that's the most important thing - we still hope. FB : And how are you doing as a family? The pair of you? GMC : I think we're doing a new normality, really, particularly over probably the last - and it seems like a long time saying it - but over the last five years. Since the Metropolitan Police actually started their investigation, it has taken a huge pressure off us, individually and as a family. FB : Because before that you were trying to fight the case yourselves, trying to encourage the police to look for Madeleine, get the Portuguese police involved? GMC : Yeah I think the key thing was - and I suppose the injustice of it - was that after the initial Portuguese investigation closed, essentially, no-one, no-one else was actually doing anything pro-actively to try and find Madeleine. And I think every parent could understand that what you want and what we have aspired to is to have all the reasonable lines of enquiry followed to a logical conclusion as far as you can do that, and that was incredibly frustrating. FB : You talked at the time about what a blow that was? GMC : It was terrible, it was horrible, and you know as much as we tried and (were) fortunate to have had so many donations into Madeleine's fund and to use that money to try and investigate, your hands are tied, you don't have the powers that law enforcement have. FB : So how much of a difference has it made. So for the last five years, the police have actively been investigating? GMC : Absolutely huge, I mean I can't emphasise enough just what a massive burden that has lifted from us, and those around us, and also knowing that the lines of investigation have been prosecuted. I know the Assistant Commissioner, Mr (Mark) Rowley, spoke during the week, but you know a lot of those lines have been taken to a conclusion and that's almost as important as finding who's actually responsible but knowing that those lines have been shut down. FB : And the police have talked about one significant lead they are still pursuing, can you tell me anything about that? GMC : The investigation is in the hands of the Metropolitan Police, who clearly have on-going inquires and from our perspective that's the important thing. KMC : They've managed to pull so much together and sift through so much information, so now we do seem to be on just several lines of enquiry rather than tens/hundreds. FB : And there are four officers working on it full-time. You know there have been criticisms that the police shouldn't be spending so much money, still, so many years on, on this case, what would you say to that? GMC : I think some of that criticism is really quite unfair actually, because I know it's a single missing child, but there are millions of British tourists that go to the Algarve, year-on-year, and essentially you've got a British subject who was the subject of a crime and there were other crimes that came to light following Madeleine's abduction, that involved British tourists so I think prosecuting it to a reasonable end is what you would expect. FB : But of course it doesn't happen, sadly there are so many children that go missing and the resources are not deployed on their cases? GMC : Others within law enforcement have made it very clear, this type of stranger abduction is exceptionally rare actually and we need to put it into perspective and it's partly why Madeleine's case is attracting so much attention, thrown in with many other ingredients, but this type of abduction is exceptionally rare. FB : One of the police officers in Portugal has been a thorn in your side for many years, he was thrown off the investigation but then he wrote a book, presented a documentary, presenting of you of what happened to Madeleine which implicates you, and you fought it through the courts. At the moment you've lost and he's won, is this the end for you now, are you going to continue to fight him? GMC : I think the short answer is we have to because the last judgment I think is terrible. So we will be appealing. We haven't launched that yet, but it will be going to the European courts. I think it's also important to say that when we lodged the action was eight years ago and the circumstances were very different where we felt there was real damage being done to the search for Madeleine at that time, particularly in Portugal. FB : Because he was effectively suggesting that you were involved? GMC : I think, you know, what people really need to realise though is, you know, as Assistant Commissioner Rowley has said again this week, and the Portuguese have said in the final report - have said there's no evidence that Madeleine is dead and the prosecutor has said there's no evidence that we were involved in any crime and really that's - saying anything opposite isn't justice, it's not justice for Madeleine. KMC : I mean I find it all incomprehensible to be honest, it has been very upsetting, and it has caused a lot of frustration and anger which is a real negative emotion, and I think we just need to channel that and I just have to hope that in the long run that justice will prevail, and all will be well. GMC : And I think it's also important for us personally, but for the rest of the family as well. FB : For your children? GMC : Yeah and our wider family, both parents, brothers and sisters etc, so - you know - we've got to challenge it, and we will do. FB : The other thing that struck me when I was looking through various internet search engines before I did this interview was quite how much cruel, distressing, horribly tasteless commentary there is out there about you, about Madeleine. People giving their opinions about what they think happened, even though they don't know you. They were nowhere near, they can't possibly know. It's so hurtful for you, that that is out there - and for your children - how do you deal with that? KMC : I think the whole social media has got huge pros, but huge cons. On the downside, and all that's been written... I guess we protect ourselves really. We don't go there to be honest. We are aware of things that get said because people alert us to them. I guess our worry is for our children. FB : Of course, because they are now 12, they are at an age where social media becomes increasingly important? GMC : I don't want to dwell on the negative aspects too long, but I think in this era of "fake news" it is extremely topical and I think people just need to think twice before what they write and the effects it has. Certainly I know ourselves with our own experience, both in the mainstream media and also on the internet, we just say I am not going to believe that until I see evidence of it. I'm sure it is a very small minority of people who spend their time doing it, but it has totally inhibited what we do. Personally, we don't use social media, although we have used it in Madeleine's campaign. But for our twins who are growing up in an era where mobile technology is used all the time, we don't want them not to be able to use it in the same way that their peers do. FB : How do you protect them? GMC : We had some excellent advice early on. We have been as open with them as we can. We have told them about things and that people are writing things that are simply just untrue and they need to be aware of that. They're not really at the age where they are on the internet and other sites, but they're coming to that stage. They're in closed groups with their friends etc and that's important. KMC : I think we've tried to educate them a little bit as well because obviously it's not just us that has fallen victim to the downside of social media. FB : Does it shock you? Because it has shocked me, certainly a little, the things that people say. KMC : I think it has been shocking... that aspect of human nature that I hadn't really encountered before. Because I think it's so far from how you would behave or people that you know would behave. It's been striking and quite hard really to get your head round. Because why would somebody write that? Why would somebody add to someone's upset - why would someone in a position of ignorance do something like that? GMC : I think we've seen the worst and the best of human nature. And our personal experience, rather than on the internet, has been overwhelmingly seeing the better side of human nature. And I think we need to remember that actually. We've had fantastic support over the last 10 years. And because there's a lot of media attention now around the 10th anniversary, we are starting to see that again as well. KMC : I think that's true. I think because things like social media, or (Goncalo) Amaral or whatever, because it's so awful and upsetting, it does kind of sometimes stand out more, it becomes more of a talking point. Whereas actually the main thing that we have experienced is the goodness of people and the support that we have had over 10 years, which hasn't wavered in all that time. FB : How different is your life now? When you have a child, you consciously or subconsciously imagine your future and the future of that child. How different is your life now to that what you must have imagined all those years ago? GMC : I think before Madeleine was taken, we felt we had managed to achieve our little perfect nuclear family of five. And we had that for a short period and I suppose, almost the same way as if your child becomes ill or seriously ill, or has died, like many other families have suffered... then your vision is altered and you have to adapt. And I think that's a theme that speaking to other people who have gone through terribly traumatic processes with children and other loved ones, that is something that gradually happens, and you adapt and you have a new normality. And unfortunately for us a new normality is a family-of-four. But we have adapted and that's important. The last five years in particular has allowed us to really properly devote time to looking after the twins and ourselves and of course carrying on with our work. At some point you've got to realise that time is not frozen and I think both of us realise that we owed it to the twins to make sure that their life is as fulfilling as they deserve, and we have certainly tried our best to achieve that. FB : On the face of it, you appear to have stayed so strong as a family unit. I just wonder how you have managed to do that? It's so easy to blame each other when a cataclysm befalls a family. That's such as easy trap to fall into. KMC : I don't think there has ever been any blame, fortunately. What people do say is that you don't realise how strong you are until you have no option. And I think that's very true. Obviously massive events like this cause a lot of reaction, a lot of trauma and upset. But ultimately you have to keep going - and especially when you have got other children involved. Some of that is subconscious I think - your mind and body just take over to a certain extent. But if you can't change something immediately, you have to go with it and do the best that you can. And I think that's what we have tried to do. As Gerry said, one of our goals - obviously ultimately finding Madeleine - was to ensure that Sean and Amelie have a very normal, happy and fulfilling life and we'll do everything that we can to ensure that. FB : Life for you has changed in different ways Kate. You were a GP. You stopped working, you haven't gone back to full-time work. I assume the idea of someone else looking after your children seemed unthinkable after what happened - you just needed to be with the children and be there? KMC : Certainly initially, yes absolutely. The kids weren't even in school, I wanted to be there, I didn't want to let them out of my sight - there was obviously a lot going on, a lot of campaign work, a lot of emotion. I am actually back at work now. I am doing something different to what I was doing. FB : What are you doing now? KMC : I am back into medicine but a different area to my general practice. So that obviously takes up some time - and again that was a big step to re-establish as normal a life as possible. Life's busy. I think in some ways, whether it's our personality or whether it's a coping strategy but sometimes it's almost a little bit too frenetic, but it keeps us going. I think we don't dwell too much on things unnecessarily so I think that's probably a self-protective thing there as well. We do have a very full life and as normal as we can make it. FB : And how much do you make Madeleine a part of it, do you talk about Madeleine, is she a name that crops up every day? How do you manage that? GMC : I mean she's always still part of our life, there's photographs all round the house, this time of year, then we can't even have conversations that doesn't involve it, kids know we're doing the interview today, the anniversary is coming up, so she is still part of it. KMC : I think every kind of event that we do, whether it be a birthday or a family occasion or even an achievement or something that is kind of when you really feel her absence. It's slightly different to how it was in the early days, when everything we were doing was to find Madeleine, whereas now we are having to get on and live a life as well, but its not like any day she's not there, if you know what I mean. FB : And last time we talked, you told me how you were still buying birthday presents and Christmas presents for Madeleine. With 10 years now, are you still doing that? KMC : I still do that yeah. You couldn't not. FB : So you go around the shops and you think, Madeleine would have been this age now, and what would she want? KMC : I do, I do, that's it. I obviously have to think about what age she is and something that, whenever we find her, will still be appropriate so there's a lot of thought goes into it. But I couldn't not, you know, she's still our daughter, she'll always be our daughter. GMC : Because Kate does all the present-buying. KMC : I do all the present buying, and yep, they'll be another one coming up - you know - in the next few weeks. FB : And Madeleine would be how old? GMC : Just coming up to 14. FB : And this anniversary, how will you get through that day? KMC : I think like I put in my message on the website, every day is another day, without Madeleine. I think it's just that number, that 10-year mark, which makes it more significant I think - that is a reminder of how much time has gone by and obviously 10's a big number. I think we'll get by as we have any other year really, we'll be surrounded by family and friends, you know, obviously we'll be there remembering Madeleine, as we always have. GMC : I think the day and the poignancy of it, that we don't tend to go back to the time, because it's so draining but inevitably on anniversaries and her birthday they are by far the hardest days, by far. KMC : I think it is important though because despite how difficult these days are, just keeping in mind actually how much progress we have made and you know nothing's ever going to be quick enough from our point of view but the last five years, we've come a long way and there is progress and there are some very credible lines of enquiry that the police are working on and whilst there's no evidence to give us any negative news, you know, that hope is still there. FB : It really is there in your hearts, the hope that one day you'll be reunited with your daughter? GMC : No parent is going to give up on their child, unless they know for certain their child is dead, and we just don't have any evidence. - La journaliste ne questionne pas vraiment, elle connaît la réponse, mais elle souhaite une confirmation dans le style MC. - La réponse n'est certainement pas ce qu'elle attendait. Elle s'adressait à une personne et on lui répond par une généralité triviale : "No parent", "you" au lieu du "we" présumé. KMC : My hope for Madeleine being out there is no less than it was almost 10 years ago, I mean apart from those first 48 hours nothing has actually changed since then, I mean - I think the difficult thing has always been how will we find her because you're relying on the police doing everything they can, and you're relying on somebody with information coming forward. GMC : I think that that is so important, that everyone thinks what could have happened, but some of the scenarios with other people that have been abducted and kept, is just so unbelievable that you think 'how could that have happened' and that is probably what is going to happen with Madeleine's case as well, that people will go 'that's incredible, how did that happen - we just don't know'. KMC : I think Assistant Commissioner Rowley underlined that last week: that you can't apply normal logic to someone who commits a crime like this - because you try and think, 'well, surely if they'd have done that, they'd done that and therefore' - but you can't. Le problème est que le commissaire-adjoint témoigne lui-même d'une logique extra-ordinaire lorsqu'il explique l'enlèvement par le fait que MMC n'avait pas l'âge de vouloir fuir pour vivre sa vie. FB : But you must also look at cases, in the case of Ben Needham who went missing in Greece, decades past and even now it's not entirely resolved, it's thought that he died very soon after he left the house but it's not known. GMC : That's interesting though you know, the people who've got the most experience are the National Centre for Missing and Exploited Children in the United States, and one of the earliest things that stuck with me ever since then is the younger that at the time a child is taken, the more likely they've been taken to be kept, and that could equally apply to Ben Needham who was younger than Madeleine so that's something we have to factor in actually. Gerald essaie d'effacer l'effet négatif de la comparaison du cas de MMC avec celui de BN, car il n'a jamais été prouvé que Ben Needham, disparu alors qu'il jouait tout près d'un chantier, avait été enlevé. Il aurait pu être fatalement accidenté par l'autochenille. FB : Which in one way could be a relief, but in another way is an unconscionable thought for you? GMC : It is, and it's 10 years, and how much has she changed and where would she be now, so, but I think the key thing is is to find Madeleine, she's still alive, recognise who she is, or we need to find the person or the people responsible for taking her. FB : You must have imagined over the years - if you saw her, do you know what you'd say to her, how your lives would change? KMC : Yeah I think I try not to go there too often to be honest it's one of those real bitter-sweet kind of thoughts, yeah, I mean, I can't imagine, 10 years is a long time, but ultimately we're mum and dad, she's our daughter, she's got a brother and sister, grandparents and lots of family and friends you know. So it would be absolutely fine, it would be - well - it would be beyond words really. We'll cope with anything. FB : Now, I know doing this interview was something you thought long and hard about, not something you particularly want to do, certainly not something you were looking forward to, what do you hope by doing an interview like this, what do you hope people will hear, what's the message you want to get out? GMC : I think, that there is still hope really, there isn't a new appeal, most of the media that we've done in the previous years is usually around that - so this is unusual. So, we are marking the anniversary. I think it's been good for the general public to hear police say there's no evidence that she's dead, and that there is still an active investigation, and there is still hope. So certainly from my point of view, somebody knows what's happened. KMC : I think you know we've had so many supporters who, I say, are still with us, people that we don't know who are still there and I guess I just want them to be reassured that there is progress being made. It might not be as quick as we want, but there's real progress being made and I think we need to take heart from that and we just have to go with the process and follow it through, whatever it takes for as long as it takes. But that there is still hope that we can find Madeleine. FB : And if you do find Madeleine you'll be able to show her everything you did to try and find her. You never gave up? KMC : Absolutely. And how many people have been there willing her home. FB : Is there anything else you would like to say? KMC : I think that is one of the positives, we were talking about the amount of money, and I used to feel really embarrassed when people used to say about the amount of money, but then you realise that other big cases, like Stephen Lawrence, these cases cost a huge amount of money. I guess the one thing, because you always do feel guilty as the parent of a missing child - that other families haven't had the publicity and the money, and I know there's reasons why that happened, but I guess the positive is that it has certainly brought the whole issue of missing children to the forefront and I think people have benefited in many different ways, really. Because of that. I know the charity Missing People has had a lot of attention, haven't they and all the families have come together I think it's just highlighted it, made people more aware, and those families have had more support from each other. FB : A small silver lining. A tiny little sliver of one. Let's end it there. Les MC ont essayé tout ce qui était en leur pouvoir pour que l'affaire ne dure pas aussi terriblement longtemps. Gerald MC dit que lorsque le Met a commencé à enquêter (il se réfère probablement à la phase "enquête" de Operation Grange, qui a commencé en 2014, suivant la phase "ré-examen du dossier", commencée en 2011), une pression énorme a été retirée de leurs épaules, individuellement et en tant que famille. Le point-clef, et il y pèse l'injustice de la situation, est que, après la clôture de l'enquête portugaise initiale, personne d'autre (que les MC) ne faisait quoi que ce soit activement pour essayer de trouver Madeleine. Gerald MC poursuit en remarquant que tout parent peut comprendre l'aspiration des MC à ce que toutes les lignes d'investigation raisonnables soient suivies jusqu'à leur conclusion logique. Kate MC observe que le Met a examiné tant d'informations que les lignes d'investigation ont pu être réduites de centaines à quelques-unes. Gerald MC considère que les critiques liées au montant dépensé (par SY, plus de 14 millions d'euros) pour rechercher Madeleine ne sont vraiment pas justes. Bien qu'il s'agissait d'une seule enfant disparue, d'autres crimes sont venus au jour après l'enlèvement de Madeleine, qui ont inclus des touristes britanniques, donc poursuivre jusqu'à une fin raisonnable est ce que l'on attend. GMC explique que l'attention qu'a suscitée l'affaire MC s'explique en partie par le fait qu'un enlèvement est exceptionnellement rare. Les MC déclarent qu'ils comptent poursuivre la bataille légale contre l'ex-commissaire Gonçalo Amaral. Comme ils ont déjà réclamé sur le fond, une initiative on ne peut plus improbable (les réclamations sont extrêmement rares, mais généralement portent sur une signature manquante ou un nom mal orthographié), ils ont donc épuisé tous les recours au Portugal. Songent-ils à la CEDH ? Gerald MC déclare sans sourciller que soutenir le contraire (qu'ils n'ont pas été innocentés) n'est pas juste, n'est pas juste pour Madeleine (et pour les MC ?). Kate MC rappelle que les propos de l'ex-commissaire Amaral lui ont causé toutes sortes de frustrations et d'irritations, mais qu'ils vont les canaliser et espérer qu'un jour la justice prévaudra. Comme les MC se sont heurtés à une barrière de commentaires négatifs dans les réseaux sociaux, ils évitent ce secteur qui critique constamment leur négligence (avoir laissé seuls les 3 enfants). Ils sont conscients de ce que l'on raconte car des gens les alertent, ils sont inquiets pour leurs enfants. Kate MC dit avoir trouvé en ligne des critiques choquantes et un aspect de la nature humaine qu'elle n'avait jamais rencontré avant... Pourquoi quelqu'un écrirait-il cela ? Pourquoi quelqu'un ajouterait-il au désarroi de quelqu'un ? Pourquoi quelqu'un qui ignore ce la situation ferait quelque chose comme ça ? Pourtant l'expérience principale des MC est la bonté des gens et le soutien qu'ils ont eu pendant dix ans, qui n'a jamais flanché. Les MC ont vu le pire et le meilleur de la nature humaine, comprenez le pire sur Internet et le meilleur ailleurs. S'adapter à une nouvelle "normalité"
Avant l'enlèvement de MMC, les MC avaient réussi à construire une parfaite petite famille nucléaire de 5. Malheureusement leur nouvelle normalité est une famille de 4. Mais ils se sont adaptés et c'est l'important. Ils continuent à acheter des cadeaux à Noël et pour l'anniversaire de leur fille, en songeant à son âge et à ce qu'elle pourrait vouloir, ce qui la fait beaucoup penser. La nouvelle normalité est que tout n'est plus fait pour retrouver Madeleine, il s'agit de vivre leur vie. Quant à l'argent que la recherche a coûté, Kate cesse d'être embarassée quand elle réalise que toutes les affaires importantes coûtent énormément d'argent. Elle pense que les gens sont (grâce à l'affaire MC) devenus plus conscients de la question des enfants perdus de vue et que tout le monde finalement y trouve son compte Elle veut rassurer leurs supporters : ce n'est peut-être pas aussi rapide que nous voudrions, mais les progrès sont réels.